I am so glad that Truman's expedition came to a happy end and that he is now home and all is well in the abode of the parrot wizard. I have not visited here for a long time. I came to know Truman was missing from my facebook friend, Ronen. I am happy that you got him back. Ahhhh!! Love it! So Happy you are reunited. %20%20%20%20%20%20%20%20%20%20%20%20%20%20[/img] I dont know how to attach my picture of our lost and found cockatoo!!!!!! lol! I am very happy to see Truman home Michael! The Real Macaw Parrot Club members are so happy to hear of Truman's safe return. We were all praying for a good outcome, as well as, constantly looking out our windows for Truman! Hope to see both of you soon! I'm so glad to hear that Truman made it back home safely! 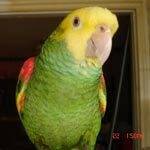 If in the future you do wish to further explore the idea of free (untethered flight) with any of your parrots - though Santina is the safest option due to her size and bright colors - I would like to suggest you contact Chris Biro. I've been following him for a while. He has been free flying parrots for over 24 years. He takes a scientific approach and has done it successfully with many birds. Here is his website: http://www.libertywings.com[/url:2g134vx9] He also has a yahoo group for discussing free flight: https://groups.yahoo.com/neo/groups/Freeflight/info[/url:2g134vx9] Again, so happy to hear about Truman's safe return!! Michael I don't know how you survived. The day the wind caught the storm door and blew Myrtle off my shoulder I thought I would die. The wind threw her into the middle of the yard and then changed and blew her into my neighbors yard. If she had been clipped the wind would have taken her away. Instead she managed to grab the top twig of a very tall tree. She kept calling me for hours until a young man on our street came to help. It seemed like days. Her learning words instead of just repeating what I said paid off. When he reached for her she told him no. I was able to tell her that he was okay and for her to go to him and she did. Hey Sarah, was thinking of you when this was all going down. Sorry you never got Tiki back! Michael, I am so happy to discover that Truman was found and that he is safely back home with you, Kili and Santina. As soon I as realized Truman was missing (after seeing your flier on the Wilton Parrot Rescue's Facebook page), I got a terrible knot in my stomach and immediately sent out a prayer that he would be found as I know how much you love your birds. After having lived with Taylor (our Black-capped Conure) for almost a year, I would be devastated if she were lost or if anything happened to her. She is truly a member of our family. Thank you for all the work you do to educate us on how to keep healthy, happy birds in our homes! [quote="Michael":3orojgz5]Hey Sarah, was thinking of you when this was all going down. Sorry you never got Tiki back! [/quote:3orojgz5] Thanks. Your story on Truman almost gave me a heart attack - I know all too well how it feels. I am so glad Truman is okay. BTW, the fact that you shared your story before helped me on my journey to finding Truman. First of all, just having discussions like that helped me have an idea of things to do and to try. Also I remember you talking about how people would prank call you and it helped me be prepared when kids were doing that to me. Because I was aware that this kind of stuff happens, it was much less hurtful than if it were unexpected. Lastly I'm not taking Truman's safe return for granted. I realize that not everyone is so lucky which is why I take this outcome very seriously and appreciate it so much. So thanks for the info you shared and I will be doing the same. 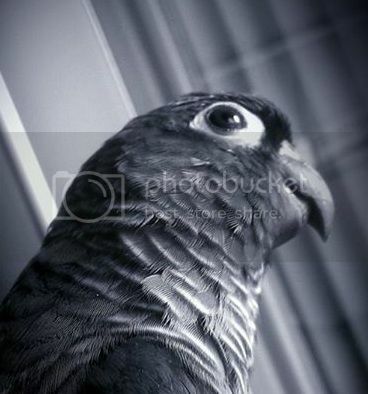 I just wanted to post and say, I took my African grey outside to another person house. We had been outside many times and no problems. My grey feathers were clipped. I was informed he could not fly. Well when I arrived my grey climbed up to my shoulder. It had rained earlier. The thunder scared my grey. He flew passed the house and into an alley. That was 9:am it stated to storm. I stayed outside until 8:40pm, calling for my little friend. I was soaked. It kept raining and I couldn't see. I walked in that alley behind the houses. I was exhausted and when it got dark I had to stop because I was no longer safe. I returned to my car heart broken. I drove down the street very slow calling his name. I could hear but through out the search I thought I heard him. I thought my mind was playing tricks. I went home and I prayed and so did everyone who knew of me. I read all these horrible things about how stupid humans were and how far I needed to look but not much hope. I took a nap and left out at 5am. I went when the sun was rising and took my home phone. When it rings my baby always says,"hello." He occasionally beeps. While walking after parking in an abandoned house driveway. I went to the back of the house. I was calling for my baby and I heard a beep. I couldn't find him. Finally he beeped several times until I looked up. He was on the ledge of the roof soaked and wet. He reached his foot for me to pick him up. I was so happy to see him again and hurt because I couldn't reach to get him. I ran to another home and requested a ladder. When the person came with the ladder it scared him and he flew away again. I continued to search and some spotted him after 4 hours. He went 4 doors down but higher up in a tree. He reached again and again I couldn't get him because he was too high. Small Birds began to attack him. Every time I called his name he squat like he wanted to jump but he was scared. When he squat the other birds attacked and he almost fell. I ask the person that was with me to shake the thin tree to keep the small birds away. He was turned towards me and had no protection from the back. I made a decision to go to the other side knowing if he flew away I wouldn't see him again. When I went to the other side he turned around. The birds was attacking but he was to duck and dodge the attack. More birds came and all of a sudden they flew away. It's started to rain hard. My help left me. I stayed outside behind a church in an alley in a storm telling my baby it was okay. My help came back to find me standing looking up yelling stop to this vicious bird attacking my parrot. He fell and was hanging upside down holding on by his beak. I asked the person to shake the tree in hopes he rocked to capture the other branches. He did just that. I spotted a larger bird that swooped down and missed my baby. I yelled go to my baby when the bird attacked and missed. He finally flew away and the little birds returned. I asked the person to shake the tree when my baby squatted. I knew he he flew this time he was clear of the alley. I couldn't get him to turn around but I couldn't stand watching him sit defensively. He was shaking from the tree and flew out and away. He swooped up and did a sharp right turn and I lost him. I didn't leave until 5:40pm. I was exhausted. I informed the neighbors to call if they see him. My Mother was out of town and was calling the animal shelter, fire department and other friends. No one could help because they say it was only a bird. Finally my Mother got in touch with animal wildlife association. They Said they rescue birds for$200. Unfortunately they was out of town and would not be back until the next day. I went home fell asleep to be awakened after 40minutes. I was informed my parrot was spotted. I got up and ran out the house driving fast as I could. My phone rang 20 times because the person said he may fly away. When I got there, my baby was in a bush at the same church next to a beautiful Magnolia tree. He was surrounded by a whole neighborhood of people. I asked them to step back slowly and to keep the noise down. My baby saw me and reached out for me I extended my arm and he came up to my neck. He hungry and thirsty. He was so happy to see his cage he went in and looked around and went to sleep. This morning he slept until 9:45am which is late for him. He reached out for me and I picked him up. He slept on my shoulders for two hours. He was happy to be home and I was relieved. I apologize for this long post but I had to share and let people know power is in prayer and never give up. My baby saw me in the rain and walked by many times not knowing he was up high. I never went pass the person back yard behind an alley on the back steet. He had instinct to remain in one spot and when he went higher he figured I didn't see him. He came all the way down to a bush. On a church lot next to a tree. I will never make the mistake again and take him out with out something to keep him in or to protect him. [quote="Michael":1nrc3tlq]BTW, the fact that you shared your story before helped me on my journey to finding Truman. First of all, just having discussions like that helped me have an idea of things to do and to try. Also I remember you talking about how people would prank call you and it helped me be prepared when kids were doing that to me. Because I was aware that this kind of stuff happens, it was much less hurtful than if it were unexpected. Lastly I'm not taking Truman's safe return for granted. I realize that not everyone is so lucky which is why I take this outcome very seriously and appreciate it so much. So thanks for the info you shared and I will be doing the same. [/quote:1nrc3tlq] That is amazing. Thanks for sharing that, Michael. I just wanted to say, I'm sorry that happened to you! That is my worst fear when it comes to Emmi and I remember what that felt like when my cat would get loose. I literally spent a few nights outside calling for him to come home with a tuna can. He always came home with leaves in his fur with the attitude of, "What the heck was the big deal? I had a blast!" I'm glad Truman came home safe and sound. It's too bad they can't talk because I bet he would have quite a story to tell. I'm so happy to hear that you recovered Truman. I can't imagine what it must feel like to go through something like this. It's a risk we take when we let the birds stay flighted, but I think it's worth it. I think you're making the right choice by not letting them free fly around the park in the city. It's a shame that the birds will lose that freedom from this incident but it's the only way to prevent it from possibly happening again. Truman had to be a naughty boy and ruin it for Kili I also want to thank you for sharing this story with those of us online. It was brave of you. It's really important that everyone knows that even expert bird handlers can make mistakes, and I think that that makes us feel better when we make them, too. Your story also shows how important it is to correctly gauge your bird's behavior. We have to pay attention, pay attention, PAY ATTENTION! Having a companion parrot means sometimes doing things (or not doing things) because of their moods. Anyway, again I am so happy that you recovered Truman and I hope that he behaves himself for you and stops being bull-headed for awhile.